TOP 10 THINGS TO DO and #EnjoyAurora this weekend, 10/12-10/16! 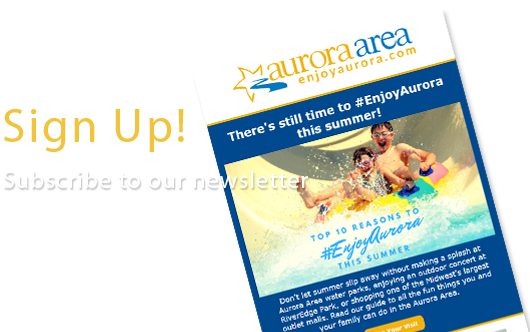 It's a very musical Top 10 Things To Do & #EnjoyAurora this weekend! 1. Stock up for winter at the last day of the 104th(!) installment of Aurora's Farmers Market this Saturday! FREE hot cider, live music, and as always, tons of fresh produce and tasty treats to take home. When you're done shopping, stop by Gillerson's Oktoberfest at Gillerson's Grubbery, which just celebrated its one-year anniversary in Aurora Downtown last week. They'll be tapping everything from experimental craft Oktoberfest beers to tried and true traditionals like Spaten and Ayinger. 2. Get in the Halloween spirit with three great family-friendly events in the Aurora Area this weekend! Take your little ones to the Disney Store Halloween Event at Fox Valley Mall where costumes are encouraged and there will be games, crafts, giveaways, and a costume parade! Princess Day at Blackberry Farm this Saturday is a great opportunity for kids of all ages to meet their favorite princesses throughout the park. Take a hayride with Snow White and hear stories and sing-along with Elsa at the Boathouse. Saturday evening from 7-10pm, get spooked at Haunted Quarry, an eerie event where the Harold Hall Quarry Beach loses its summertime cool in favor of a ghastly autumn chill. Kids 10+ are invited to enter... if they dare. 4. Rejoice! Sister Act comes to Waubonsee Community College this weekend for three performances Friday, Saturday, and Sunday at the Auditorium on the Sugar Grove campus. This feel-good tribute to the power of friendship is the musical comedy based on the 1992 smash hit movie starring Whoopi Goldberg, Maggie Smith, and Kathy Najimy. You'll laugh, you'll sing, and you'll want to get up and raise your hands and stomp your feet along with this production presented by the Fox Country Players! Pair your evening's entertainment with a heavenly meal at dining destinations Hardware or The Turf Room in nearby North Aurora, where the food & drink is truly out of this world. 5. Indie rock & bluegrass fans, this is your weekend at The Rivers Edge Bar & Grill in Batavia! Friday 10/14 join Chicago's Hungry Mountain on the patio stage for their superb brand of focused, energetic power-pop. Saturday 10/15 local bluegrass heroes River Valley Rangers at The River's Edge! promise to bring the house down with a winning combination of covers and originals -- bring a friend and your dancin' shoes! And if you haven't had enough of the River Valley Rangers, check them out again Sunday on the patio for Bluegrass Sundays at The River's Edge! 6. Celebrate 27 years of A.D.O.P.T. Pet Shelter making our communities a better place for pets with the 5th Annual Furtoberfest at Two Brothers Roundhouse this Sunday, 10/16 at 12pm! Enjoy an all-you-can-eat Oktoberfest feast, open bar with local craft beers, silent auction, live music and wine pulls! All proceeds benefit A.D.O.P.T.! 7. Take a trip back in time to the Jazz Age this Sunday night with theYorkville Big Band Monthly Dance at the Yorkville American Legion! Pro-tip: stop by early for dance lessons, whether you're the proud owner of two left feet or you can do the jitterbug with the best of 'em! 8. Find time this weekend to get your art fix at Water Street Studios Batavia with the opening of landscape photography exhibit Rural Studies Gallery Opening Reception Friday, 10/14 and Waterline Writers Sunday 10/16, where the area's literati meet & greet and enjoy spoken-word performances in poetry and prose. Enjoy fine dining at Gaetano's Batavia, who will also be catering Friday's opening, and shop Batavia MainStreet's new boutiques! 9. Few spots remain for this weekend's last Moonlight Tours at Farnsworth House, a magical journey along a lighted path next to the Fox River which brings you to Mies van der Rohe's modernist domestic masterpiece built in 1950. We had the opportunity to visit the house on a sunny autumn afternoon and can't wait to return for a tour offering the unique perspective of the house lit up and the full moon beaming. 10. The Riverfront Playhouse opened Reefer Madness Tell Your Children last weekend, taking one of the worst-rated movies ever made and transforming the tale into a heady mix of wit, parody, and cultural criticism. "Freak out" with performances all weekend long at this storefront theater and visit nearby Leland Legends Pub & Grill to check out their revitalized menu and charming atmosphere for dinner & drinks in the heart of Downtown Aurora. Check us out on Instagram at @EnjoyAurora and tag us in your favorite shots from the weekend!